Congratulations on getting married! 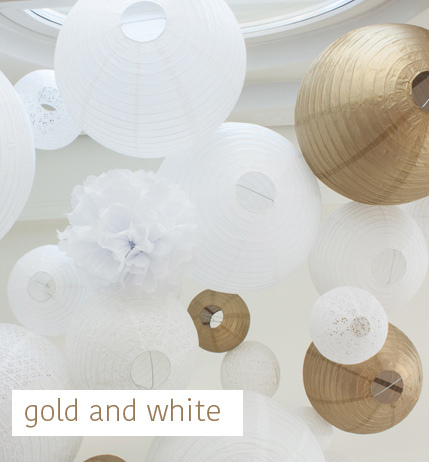 Here are our best tips to create a gorgeous wedding setup with our paper lanterns! 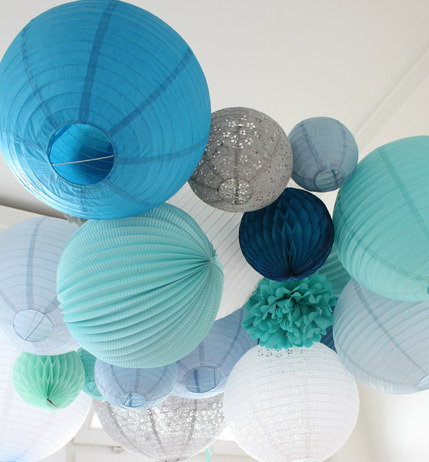 With paper lanterns, paper pompoms and other paper decorations, you will create a dreamy decoration for your big day! And we have so many one-of-a-kind colors that you can be sure to create a unique piece of décor for a memorable event. All our products are really easy to hang and to mix and match to fit your wedding theme (castle wedding, nautical, boho...) and specific venue. Last but not least, many of our future brides reuse their lanterns after their wedding to decorate their first child's birthday or their home! Get inspired with our favorite clients' wedding setups! Which lanterns to choose for your wedding? How many paper lanterns do you need for your wedding? 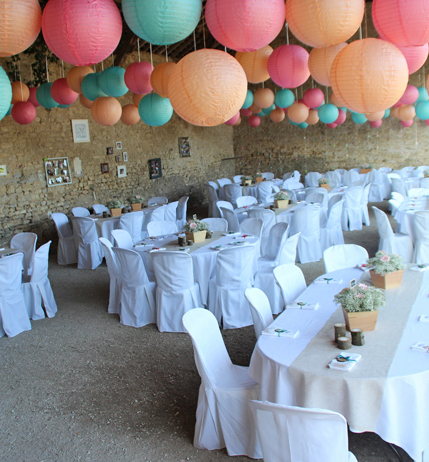 How to hang paper lanterns in your wedding venue? Can the paper lanterns be illuminated? These are our favorite clients' wedding decorations. Products used are described on each picture. HOW TO CHOOSE YOUR COLORS ? If you're starting to plan your big day, you might already have in mind a specific theme (nautical, boho...), a favorite color palette (pastel, neutral, all white...) or a specific kind of atmosphere for the celebration and reception decor. 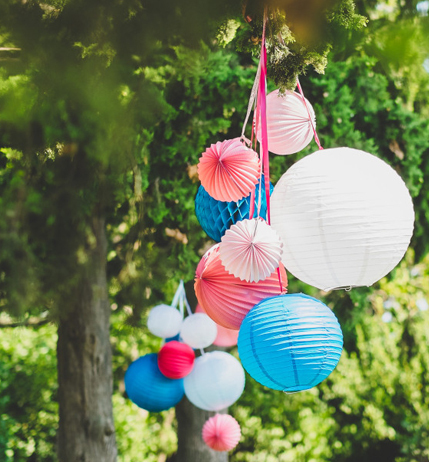 Since we have so many one-of-a-kind colors to choose from, you will be able to add some lanterns to your wedding decoration, whatever your vision. 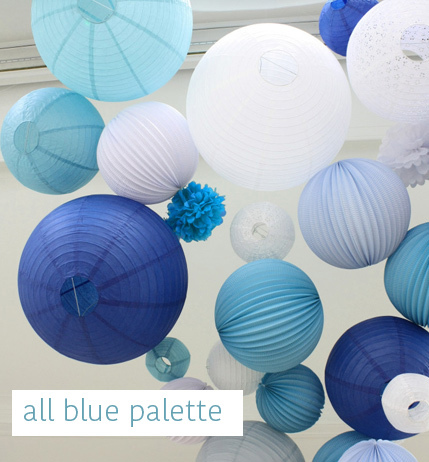 Mixing and matching our colors will enable you to create a very unique wedding decoration. Some future brides like to match their lanterns to other details of the wedding, for instance floral arrangements on the tables, or stationary color palette. 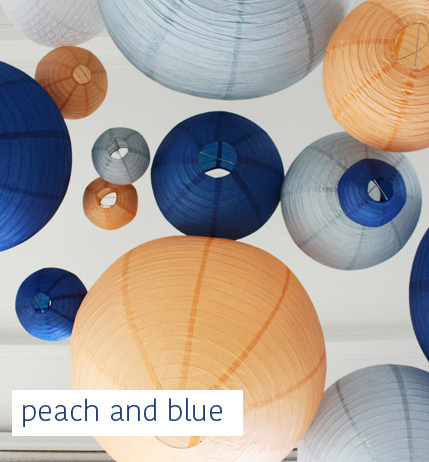 Now our dearest tip, just for you: don't get too anxious over the exact accuracy of your paper lantern colors. The finish will greatly vary according the luminosity of the venue where you will hang your lanterns, because of the difference of materials between some of lanterns (like paper lanterns, made of very thin paper) and others (accordion paper lanterns, in thicker paper). 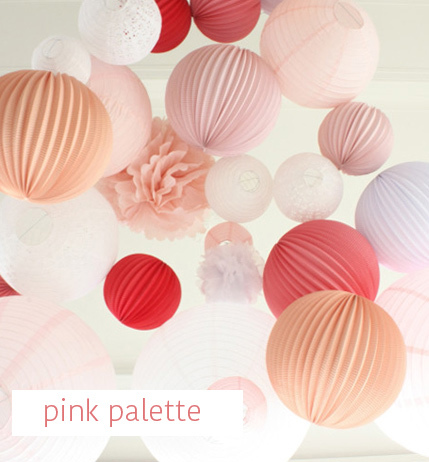 Also if you shop some of our products that do not match 100% your Pantone references, once hung on the ceiling, the general feeling will be totally in line with your wedding color palette or theme. White is always a good idea! 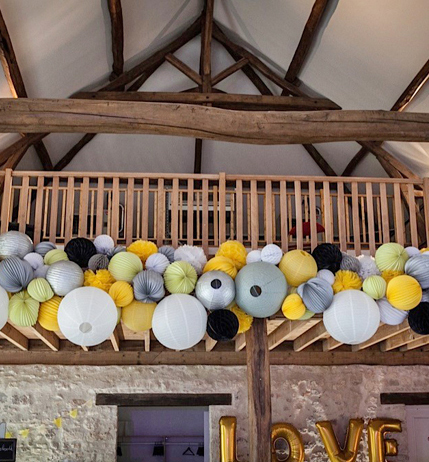 In general, our clients choose to decorate their wedding with traditionnal shapes like paper lanterns, accordion paper lanterns and pompoms, but you could absolutely add some honeycomb balls or star lanterns to the mix. 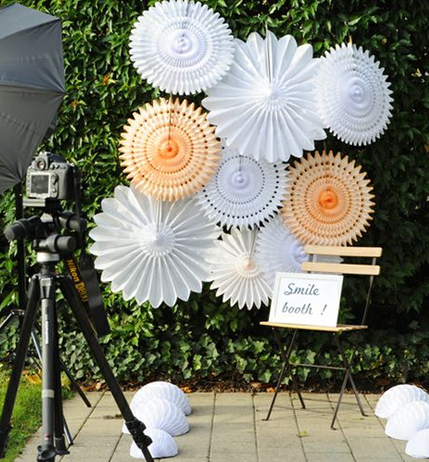 For a great party backdrop, paper fans are always a great choice as they are super easy to hang and cover a lot of space. 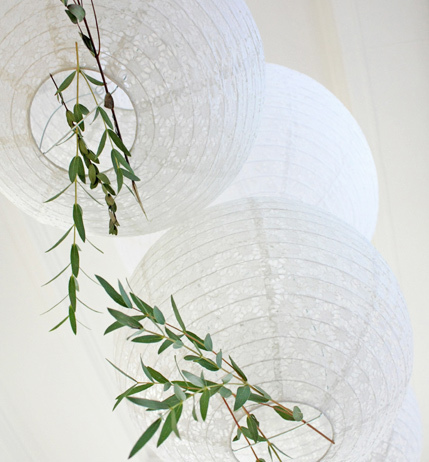 HOW MANY PAPER LANTERNS DO YOUR NEED TO DECORATE YOUR WEDDING VENUE? 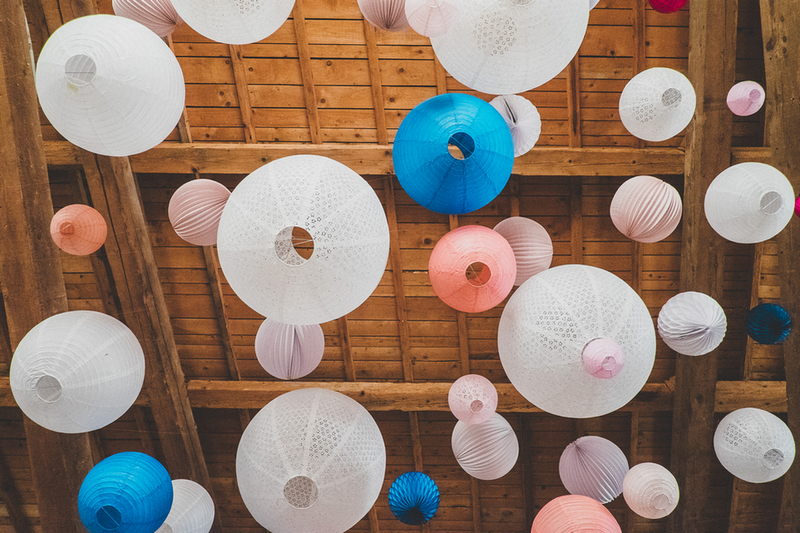 To decorate the entire venue ceiling using some lanterns here and there as touches of color, we recommend 9 paper lanterns or other decorations for every 18 square meters of space (190 square feet). You can of course adjust to what you feel is right for your wedding and your budget. 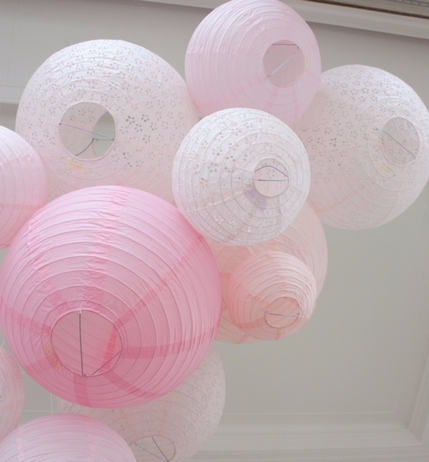 For a fuller look, go ahead for 9 paper lanterns or other decoration for 8 square meters (85 square feet). 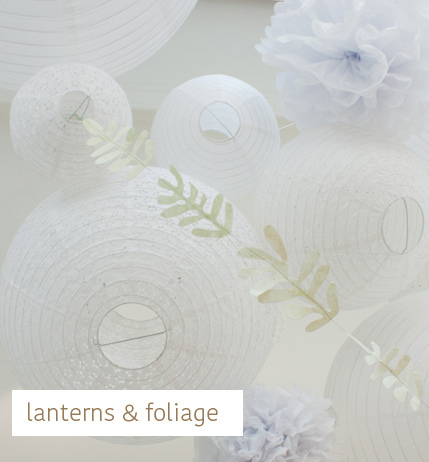 Check out our paper lantern sets for turnkey venue decorations! Another solution is to string a very fine twine along the centerfold of your wedding tent and mix and match color forms that suit your wedding best. Each piece has a small hook for paper lanterns or a small string attaching the honeycomb ball and paper fan. That way it's super easy to hang them from the central twine. We also really like when a group of 6-7 elements are hung together at some points of a wedding venue, or in the trees for an outdoor cocktail party or reception. Remember we are always at your service if you need help to define the final number of paper lanterns you need to purchase for your event. 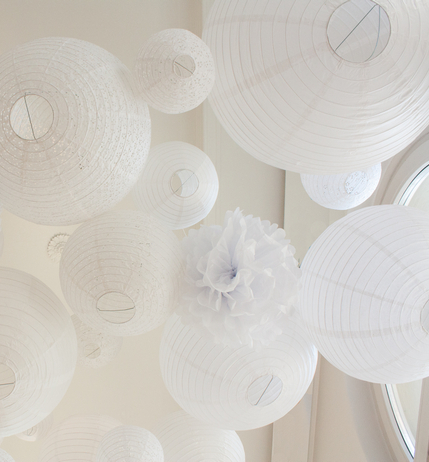 HOW TO HANG PAPER LANTERNS IN YOUR WEDDING VENUE ? All our paper lanterns and accordion paper lanterns have a small metallic insert or hook that you can use to hang the lanterns from fishing line or thread. Our other products (honeycomb balls, paper fans, paper pompoms) have a small string you can use for hanging. Once you’ve checked the hanging possibilities for your wedding venue, you can go ahead and decide the best way to proceed. 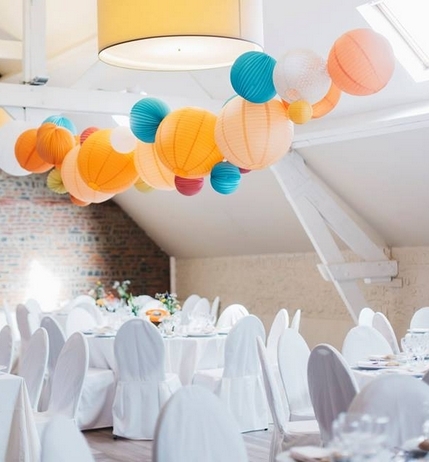 The easiest way to go is to string fishing line or thread to create a « net » over your party venue, on which you will be able to hang your paper lanterns and at different heights. In a wedding tent, you can also use the metallic structure of the ceiling for an easy hanging solution. If you want to decorate only specific spaces in your venue (i.e. the dance floor or dessert table), you use the same technique in the smaller area. 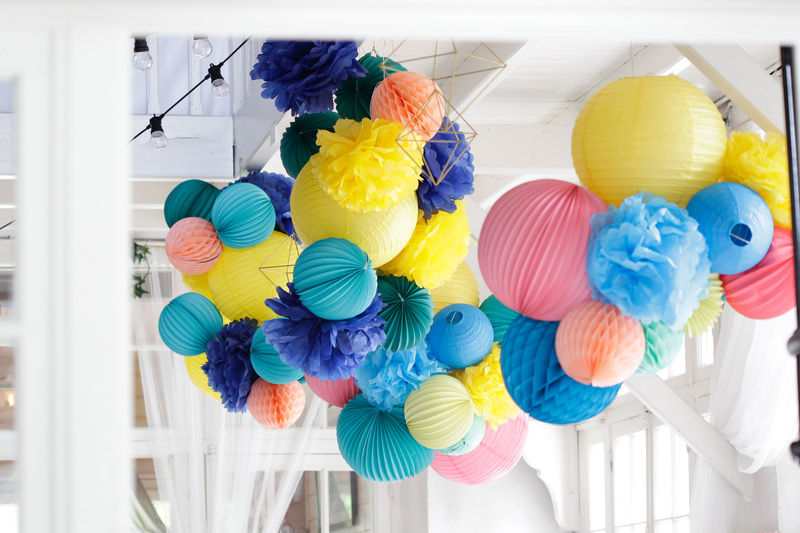 If you choose to create paper lantern clusters to hang at different points of your venue, here's the easiest way to proceed: you can create these on the floor or at your height, using a common string loop that you will be able to easily hang once the cluster is ready. You could totally use tree branches if your celebration is outdoors! 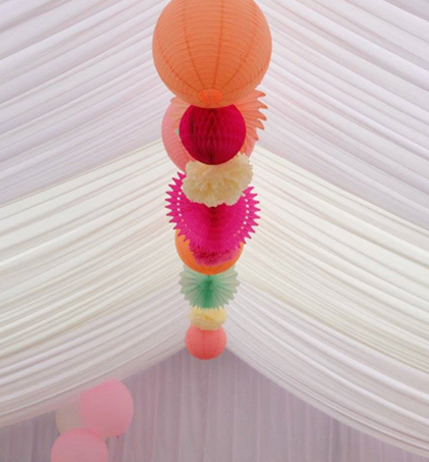 Some of our clients also use specific features of their venue to hang paper lanterns: a staircase, balcony etc. Concentrating paper decorations around these features will create a great dramatic effect. If you have organized a photo corner, or want a pretty backdrop for your dessert buffet, use our paper fans that are super decorative and so easy to set up. Most of the time, washi tape can be used (although you need to test if it is strong enough to holds your décor for a long period). 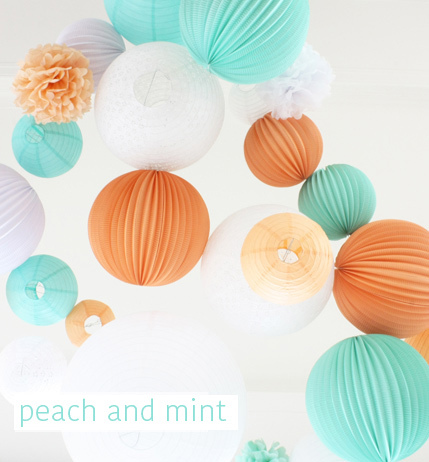 You can tape small sized paper lanterns on a big piece of cardboard for a modern and super festive backdrop. 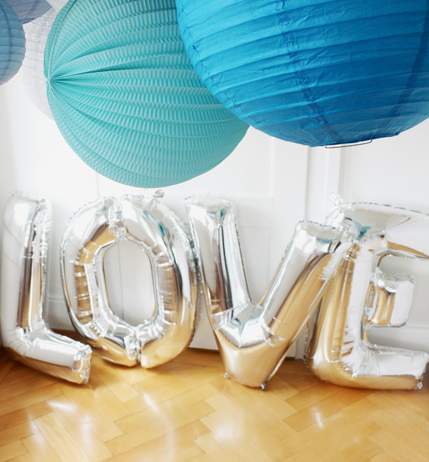 Our LOVE oversized balloons look also amazing as a party backdrop. Easy to inflate (no helium needed if you do not want them to fly) and very decorative! Most of our clients use them as simple decoration items without illumination (which also has an impact on budget) but if you would like some lights in your lanterns, for the product "paper lantern" in sizes 35cm and 50cm, you can use a bulb of 40W max, making sure you center the bulb right in the middle of the lantern, using the little "C" hook on top of the lantern to fix the electrical cord. Need more inspiration for your wedding? We offer a free styling service for your wedding! Send us an email with details about your wedding, your theme/color palette and your vision and we will be happy to help you put up the best combination for your big day. Have you ckecked out our blog? It's a great source of inspiration with tons of amazing wedding pictures.